Champions, Duke Kahanamoku and Frances Cowells, 1915. Duke Kahanamoku and Frances Cowells, two of America’s greatest swimmers. The Duke was the hero of the last Olympiad and is the holder of several world’s records, while Miss Cowells holds four American records. The picture was snapped at the World’s Fair in San Francisco shortly after the exposition swimming meet, of which Miss Cowells was the undefeated champion among the women. This is an unusual picture of the swimmers as it shows them in their street clothes. The Day Book, Volume 4, Number 268, Page 24. 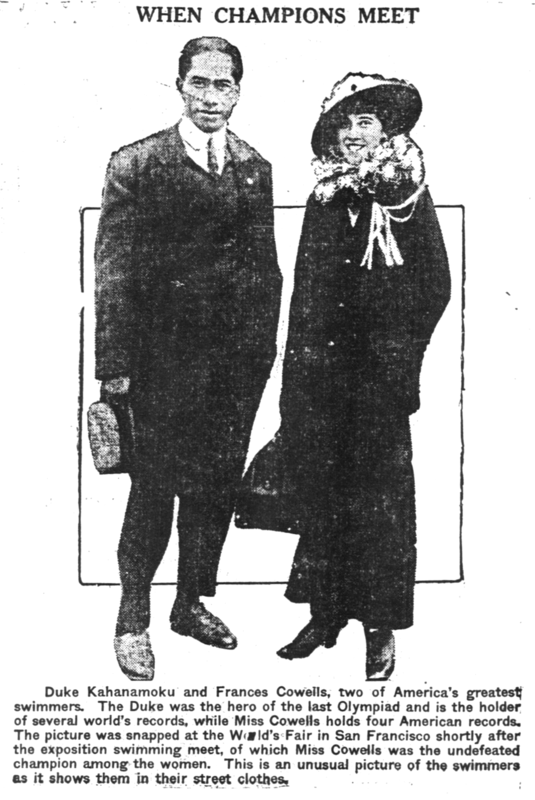 August 11, 1915. Honolulu on the big screen, 1915. Midday this past Monday, just as was announced some days ago, people crowded Hotel, Fort, King, and Bishop streets hoping to get their images in a movie of Honolulu which will be taken to the coming Panama-Pacific International Exposition in San Francisco.